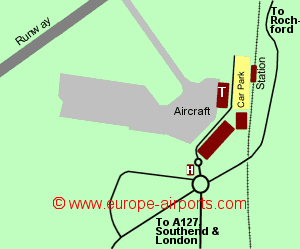 Southend airport has been undergoing development work since being bought by the Stobart Group in 2008, and the new terminal building opened in February 2012. In April 2014 the airport opened a terminal building extension. The extra space increased the number of check in desks / baggage drop off points, the amount of security screening channels, and departure lounge area. 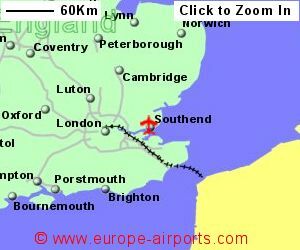 Southend airport has it's own rail station from where there upto 8 trains an hour make the 53 minute journey to London's Liverpool Street Station. 5 Bus routes stop at Southend airport. The 129 room London Southend Airport Holiday Inn opened in October 2012 and is situated approximately 200m from the terminal building. Southend was London's third busiest airport in the 1970's, before the development of Stansted. Recorded passenger numbers for 2015 were 1.1 million, an increase of 25% from the previous year.